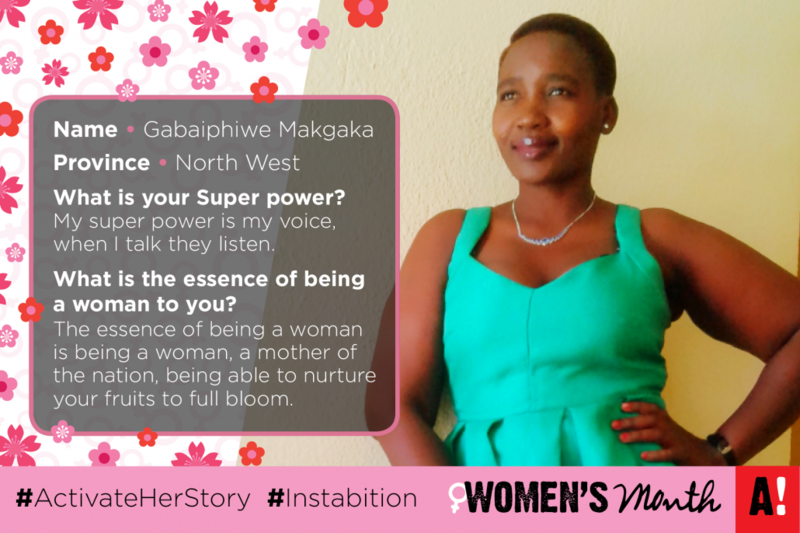 Gabaiphiwe Makgaka's Super Power Is Her Voice - Activate! The essence of being a woman, is being a woman, a mother of the nation, being able to nurture your fruits to full bloom. My super power is my voice; when I talk they listen. Independent, strong, loving and caring. YES I do. I am a woman and we go through a lot and we still hold it down. The women who all took a stand in 1956 were not just doing it for themselves, they showed the world that we are strong and for that this month means a lot to me as a woman. Yes it does, if that woman is not a mother, she is a wife or sister. Society perceives women as weak and useless and that they talk too much. I am committed to change by being a role model to the upcoming generation, help them achieve more than what I did at their age and be able to stand for what they believe in and what is right. The role of a woman in developing a country is educating the nation and making sure that the country is in good standing, support and encourage the leader to do what is right at all times. It’s simple, I want to be a woman not just a woman but a woman with a voice, not just a voice but a strong voice. Independent country with a better looking future. Yes, it might not be perfect but it will be one of the best countries in the world. It’s okay to make mistakes. Just remember to learn from them and don’t be too quick to make decisions that will change your life. Learn and learn from everything that you do.